Any reason imposed by the school to disapprove a parent's account is required to perform the steps below. 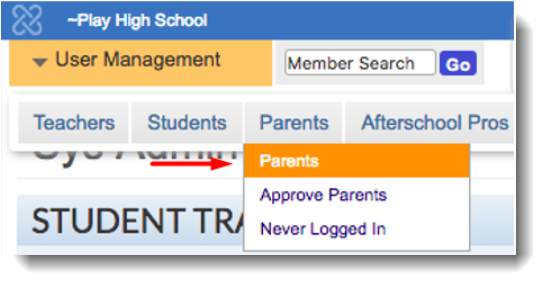 From your portal homepage, go to User Management and select parents from the Parents pull-down menu to see a list of all parent accounts. Click the name of any parent in the list to edit that account. On the edit account page, click the Disapprove link in the Approval Status section as pictured below. The students approved for a parent's account appear at the bottom left of the account edit page. You may remove a student by clicking the "Remove student from parent account" link. Similarly, you can remove a parent from a student's account. Once the parent logs in to the School Loop account, they will receive this message.